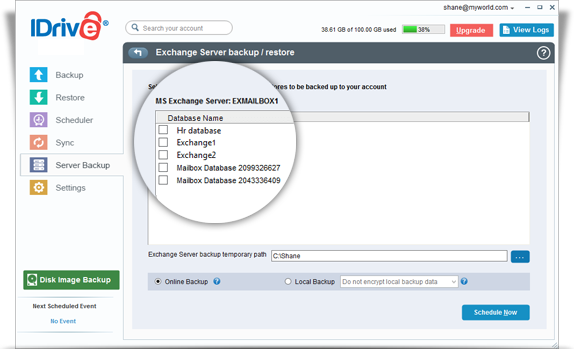 How do I take an online backup of the MS Exchange Server databases? Do I need to stop the Microsoft Exchange Server service to take a backup? On completion of MS Exchange Server backup, I see a folder by the name 'IDriveExchBackupset' in my IDrive account. What is it? Can I add/modify the files in the Exchange Backup folder 'IDriveExchBackupset'? What versions of the MS Exchange Server does IDrive application support to backup/restore database files? Does IDrive support cluster backup for MS Exchange Server 2010, 2013 and 2016? How secure is the data transfer during backup/restore using IDrive - MS Exchange Server Backup? Can I edit the MS Exchange Server scheduled backup job using IDrive? Can I select a shared or mapped drive as the destination for the MS Exchange Server backup? Can I remove the Exchange Backup folder 'IDriveExchBackupset' from my local computer on completion of the MS Exchange Server backup to my IDrive account? How do I restore data back to the MS Exchange Server? How do I restore emails from Exchange Server using IDrive - Exchange Server Restore? Does IDrive support restore of the MS Exchange Server Recovery Storage Group? Does the Recovery Storage Group cause the MS Exchange Server restore operation to fail? Does IDrive support Incremental backup of Exchange Server 2010/2013/2016 to a local backup location? How can I create recovery databases in Exchange server 2010, 2013 and 2016? Do I need to disable Circular Log for Exchange Server backup? Does IDrive - Exchange Brick-Level Mailbox backup require any Mailbox rights to be granted? How do I perform an Exchange brick-level backup? What are the minimum System Requirements to perform an Exchange – Brick level backup? I am receiving error messages stating 'The specified module could not be found' / 'ActiveX component can't create object' etc, in the log file during the Exchange Server Brick Level-Mailbox backup operation. Why? Can I perform Exchange Brick Level Mailbox restore with IDrive? Does 'Exchange Brick-Level Mailbox backup' support full backup or recovery of MS Exchange Server database? Do I need to install Microsoft Outlook to perform the 'Exchange Brick-Level Mailbox backup' with IDrive? Does IDrive support 'Exchange Brick-Level Mailbox' backup and restore on all the nodes of MS Exchange Server 2013/2016 DAGs? Is there a need for an additional/external storage volume for 'Exchange Brick-Level Mailbox backup'? I get a pop-up dialog box requesting for the authentication of mailboxes, while performing the Exchange Brick-Level Mailbox backup. Why? I am receiving an error message stating "Error in IMsgServiceAdmin::ConfigureMsgService: MAPI_E_NETWORK_ERROR" during Brick level backup. Why? Do I need to create public folder database for Brick level backup? Brick-Level backup using IDrive latest version, maintains folder hierarchy with Organizational Unit name in the backup location. Why? IDrive provides an easy, secure and reliable way to backup the MS Exchange Server databases to your IDrive account. Log into IDrive desktop application and click the 'Server Backup' tab. Under MS Exchange Server section, click 'Backup'. Select the mailbox database(s) from the list which appears and specify the local backup location. Select Online Backup or Local Backup radio button, and click Schedule Now. Note: Ensure that the selected temporary folder on the local computer has sufficient free hard drive space to hold the MS Exchange Server backup files. You cannot select a remote location as a temporary location for the MS Exchange Server backup. 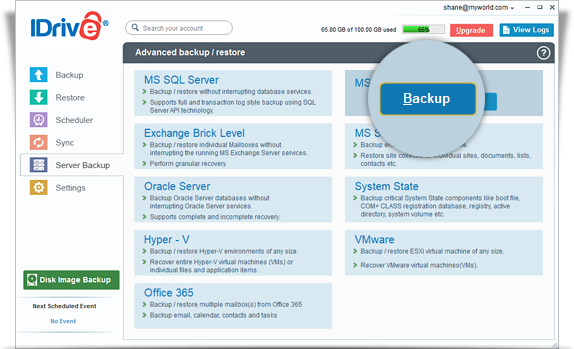 The 'Schedule backup' screen is displayed where you can schedule the backup for any future day and time or perform an immediate backup of the selected databases. On successful backup of the MS Exchange Server databases to your IDrive account, the files are stored in a folder called 'IDriveExchBackupset'. It is not advisable to update or delete files manually as it may interrupt the Exchange Server restore operation. Also, avoid using the 'IDriveExchBackupset' as a destination folder for any other backup/ restore operation. At any given point of time, you can maintain only one backup job named 'IDExchangeServerBkset'. No. IDrive is designed to perform online backup of the MS Exchange Server databases without interrupting the running MS Exchange Server services. 'IDriveExchBackupset' is the Exchange Backup folder created during the IDrive - MS Exchange Server Backup operation. All your MS Exchange Server backup data is stored in this folder. No. It is not advisable to add/modify the files in the Exchange Backup folder 'IDriveExchBackupset'. Any modification to files in this folder would impact the MS Exchange Server restore operations. Currently IDrive supports backup of MS Exchange Server 2016, 2013, 2010, 2007 and 2003. Yes. IDrive supports cluster backup for both Brick-Level Mailbox backup and Database backup in MS Exchange Server 2010, 2013 and 2016. If you connect to the cluster Exchange Server, the available databases will appear. 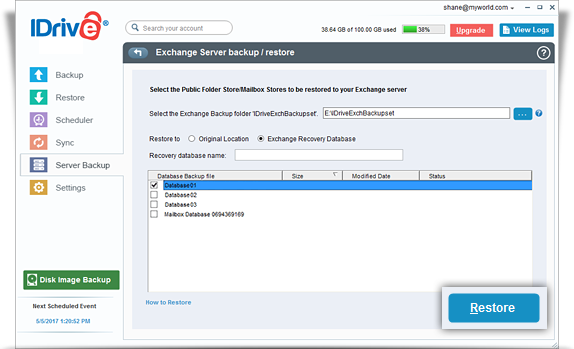 You can backup/restore all the cluster Exchange Server databases in one go with IDrive. You can also backup/restore individual mailboxes of different Exchange Servers which are connected to the cluster exchange server. IDrive transfers and stores data using 256-bit AES encryption, with a user-defined key that is not stored anywhere on the servers. This ensures data is safe and secure. Yes, you can edit and update the scheduled backup job using IDrive. Log into IDrive desktop application and click the 'Scheduler' tab. Select the backup job 'IDExchangeServerBkset', from the 'Backup set name' dropdown. Make the required changes using the check-boxes. Note: At any given point in time, you can maintain only one backup job named 'IDExchangeServerBkset'. This implies that when you try and schedule multiple MS Exchange Server backup jobs with different content, the IDrive Exchange Server Backup job considers only the last created backup set. No. 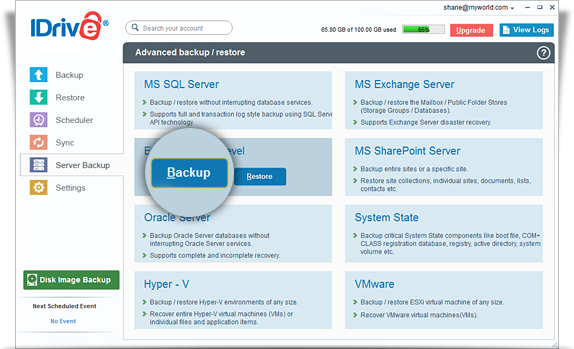 You cannot select a shared or mapped drive as the destination for your MS Exchange Server backup. Yes. You can remove the Exchange Backup folder 'IDriveExchBackupset' from your local computer on successful completion of the MS Exchange Server backup to your IDrive account. You can restore data from your IDrive account to MS Exchange Server using the IDrive - Exchange Server Restore option. It is advisable that a qualified database administrator carries out the data restore. The restore operation overwrites the existing databases on the MS Exchange Server. Before initiating the restore operation, do take an offline backup of MS Exchange Server databases that need to be restored. 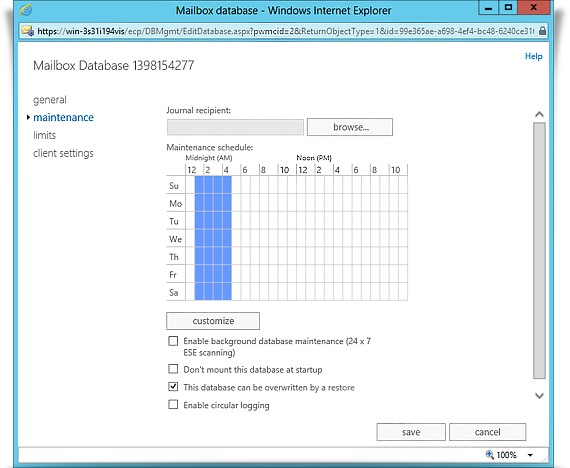 Dismount the mailbox store/database and change mailbox database properties. Open Exchange Control Panel and select the 'databases' in Exchange Admin Center. 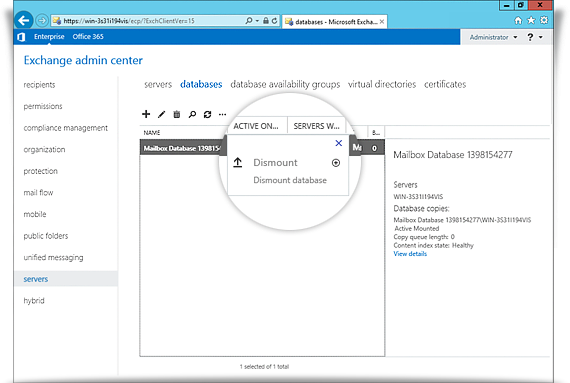 Select the 'Mailbox' database from 'servers' that needs to be restored and choose the 'Dismount database' from the 'More' option. Double-click the Mailbox database and choose the 'maintenance' tab from 'Properties' window. Select the 'This database can be overwritten by a restore' option and click the 'save' button. Perform steps 'c' and 'd' listed above for all databases that need to be restored. Note: Once the above mentioned steps are executed, close the 'Exchange Control Panel' before initiating the restore operation. Once the databases have been dismounted, log into IDrive desktop application and click the 'Restore' tab. Locate and select the 'IDriveExchBackupset' folder in your IDrive account. Click the 'Restore Now' button, to restore the 'IDriveExchBackupset ' folder to the local computer. Note: The 'IDriveExchBackupset' folder selected for restore should be in the same path as it was while performing the backup operation. Once the folder has been successfully restored, click the 'Server Backup' tab. Under MS Exchange Server section, click Restore. 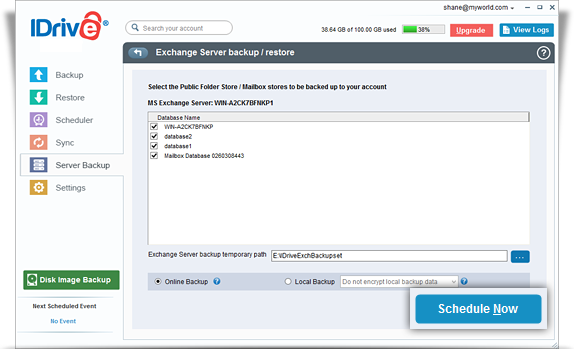 The 'Exchange Server backup/restore' screen is displayed. Browse and choose the 'IDriveExchBackupset' folder (restored earlier from your IDrive account). Do not interrupt the operation during the process. On completion of MS Exchange Server restore, the restored databases (the 'Public Folder' store/ 'Mailbox' stores) are automatically mounted. To restore even a single email, you must restore the complete 'Mailbox' store (Database) associated with that particular user. Refer MS Exchange Restore for more details. In addition, IDrive's Brick-Level Mailbox backup has granular mailbox backup/restore capability. You can use this method for backup/restore emails from/to your Exchange Server Mailbox. No. IDrive only performs backup/restore (crash recovery) of MS Exchange Server storage groups/databases (mailbox stores). Yes. The MS Exchange Server restore operation may fail if the Recovery Storage Group is present during restore operation. To resolve this issue, remove the Recovery Storage Group and then perform the restore operation. Note: It is advisable to take an offline backup of the Recovery Storage Group before deleting it. Yes, IDrive supports incremental backup of Exchange server 2010/2013/2016. Yes. 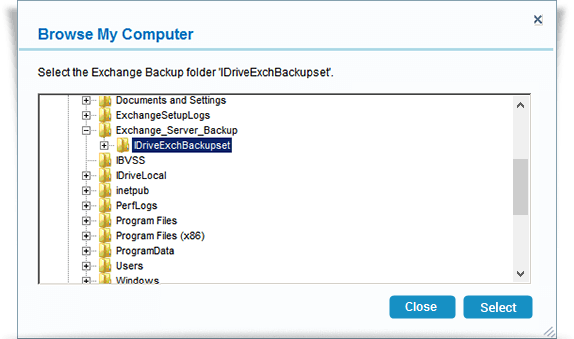 IDrive uses VSS-based method for Exchange Server backup. Hence, you should disable Circular Log for the backups to occur. To perform MS Exchange Brick-Level backup of 2003 and 2007 Servers, you need to provide appropriate permissions for the mailboxes. Click here to know more on mailbox rights. To perform an Exchange brick level backup, first download and install the Microsoft Exchange Server MAPI Client and Collaboration Data Objects 1.2.1. Under Exchange Brick Level section, click 'Backup'. Select the mailbox(es) that you wish to backup to your IDrive account from the MS Exchange Server. Note: Ensure that the selected temporary location on your computer has sufficient free space to hold the contents of the individual mailboxes of the MS Exchange Server. You cannot select a temporary location on the remote location. 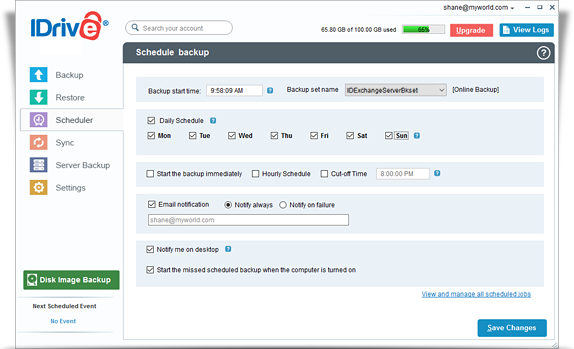 The 'Schedule backup' screen is displayed where you can schedule the backup for any future day and time or perform an immediate backup of the selected mailbox databases. These error messages appear if a component required to perform the Exchange Brick-Level Mailbox backup is not properly installed. Ensure that the IDrive application is installed correctly. Alternately, follow the steps listed below to register the required component manually. "Type regsvr32" <IDrive installation path>\"IDriveRedempDll.dll"
Yes. You can perform Brick level Mailbox restore using IDrive. Locate and select the personal folder (*.PST) from the 'IDExchBrick' folder in your IDrive account. Click the 'Restore Now' button, to restore the .PST file to the local computer. Once the .PST file has been successfully restored, click the 'Server Backup' tab. Click Restore, under Exchange Brick Level section. 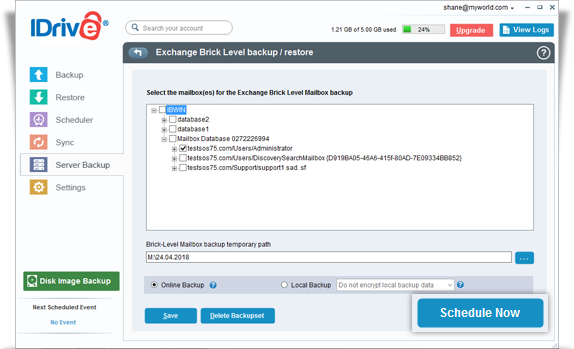 The 'Exchange Brick Level backup/restore' screen is displayed. Browse and select the .PST file from your local computer (the location where the folder was restored earlier from your IDrive account). 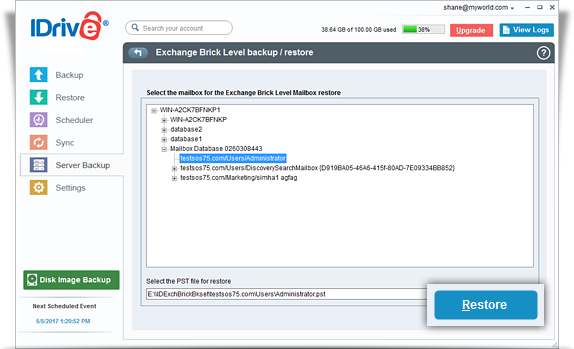 Click the 'Restore' button to initiate the Exchange Server Brick Level restore operation. No. 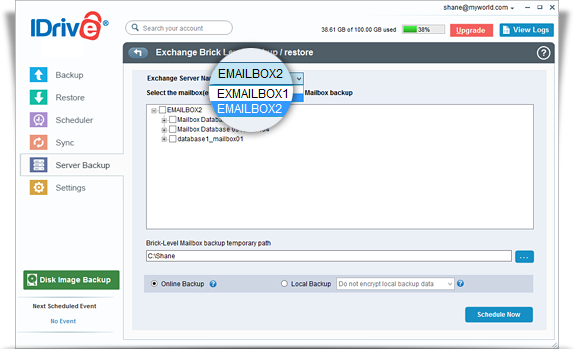 IDrive - Exchange Brick-Level Mailbox backup is designed to backup individual mailboxes for the selected mailbox stores. It is not a method for the complete backup or recovery of the MS Exchange Server database. To perform the complete Exchange database backup or Exchange recovery, use the Exchange Server backup/restore feature of IDrive. No. IDrive's 'Exchange Brick-Level Mailbox backup' does not require Microsoft Outlook to be installed on your computer. Yes. IDrive supports Exchange Brick-Level Mailbox backup and restore on all the nodes of MS Exchange Server 2013/2016 DAGs. No. However, do ensure that the 'temporary' location that you select while scheduling the 'Exchange Brick-Level Mailbox backup' has sufficient disk space to hold the selected mailbox items, during the backup. This may happen if you have not granted the required privileges for the mailbox(es) that you wish to backup. Ensure that appropriate Mailbox rights are granted to perform the 'Exchange Brick-Level Mailbox backup' of the selected mailbox(es) using IDrive. The error message may occur if the default account used to run services is the local service account that does not have any network access rights. To resolve this issue, run the service under a domain account. Yes. To perform the brick level backup, you need to create public folder database on Exchange Server 2013/2016. We have enhanced IDrive to support Exchange Server Cluster Brick-Level backup. To avoid overlapping of username based PST files from different Organizational Unit during backup, application maintains folder hierarchy with Organizational Unit name. To avoid multiple copies of PST files in your account, you may rename the previously backed up PST file path to the current backup path.